The Olympic Driftwood Sculptors are celebrating their 10th Anniversary and invite you to their annual Lavender Festival Art Show. Over 150 driftwood sculptures by member artists will be showcased and works-in-progress will be demonstrated throughout each day. 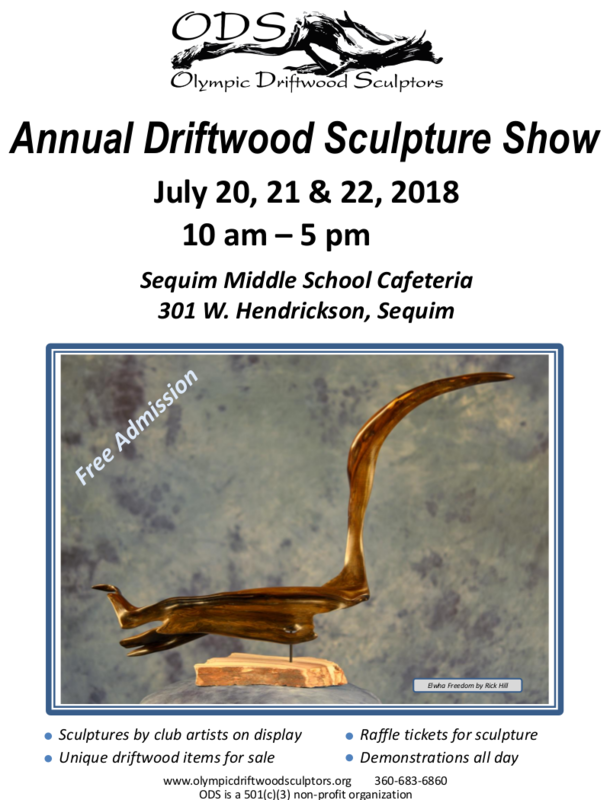 One-of-a-kind handcrafted driftwood items will be for sale in the driftwood boutique as well as raffle tickets for an original driftwood sculpture. Admission is free. Donations are gratefully accepted by this non-profit organization that offers scholarships to art students. “ODS” began in 2008 with 13 members and has grown to a current membership of 90 artists. The group offers several events annually, including its biggest show in July during the Sequim Lavender Festival. They also offer classes on the art form, monthly meetings, and workshops. For more information please contact Tuttie Peetz at 360-683-6860.